The parish of Trowse with Newton is situated to the southeast of the City of Norwich, and contains the village of Trowse, as well as outlying parts of the Whitlingham and Bixley areas. The parish has been recorded as ‘Trowse with Newton’ since at least 1881, although the reference to Newton is unclear. The parish boundaries were reduced in 1935, when 19 acres were transferred to the parish of Thorpe next Norwich, and currently has an area of almost 450 hectares. To the west the parish is bordered by the River Yare, across which sits the City of Norwich, and the very southern tip of the parish contains the A146/A47 junction. This recently built bypass has diverted traffic away from the village, which despite its close proximity to Norwich remains a quiet village complete with village green. The parish also contains the large area of Whitlingham Country Park, which contains two broads and is derived largely from the remains of Crown Point Park. Trowse is situated just to the north of Bixley parish, which contains Arminghall Henge (NHER 6100), one of the most important prehistoric discoveries in Norfolk. This Neolithic ring ditch has numerous counter-parts in Trowse, (NHER 32051), including the Trowse Barrow (NHER 9592), as well as a Neolithic ring ditch which shows signs of also being a flint working site (NHER 9605). Further evidence of prehistoric flint working sites has also been noted in Whitlingham Country Park (NHER 13927 and 18164), as well as under the southern bypass (NHER 9589). This later site shows evidence of occupation through the Neolithic, Bronze Age, Iron Age and into the Roman period, including Iron Age enclosures. 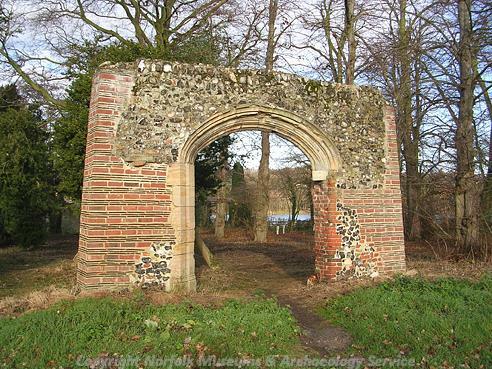 It is therefore not surprising that a number of prehistoric flint objects, some dated to the Mesolithic and Neolithic periods, have been recovered from this parish. These include a Mesolithic blade (NHER 40903), Neolithic or Mesolithic axeheads (NHER 33448 and 36610) and cores (NHER 39618) and Neolithic flakes (NHER 15462, 15788 and 34493). Objects from the Bronze Age (NHER 25709) are also largely flint, though pottery sherds have also been recovered (NHER 9589). Iron Age finds are also limited, with one coin recovered (NHER 40903), as well as pottery sherds (NHER 9589). Settlement in the area continued in the Roman period NHER 9589), and a number of objects have been recovered from this area. These include coins (NHER 24793 and 25391) and pottery sherds (NHER 9601, 15553 and 25710), as well as metal objects such as brooches (NHER 31665 and 40903). There is also evidence of occupation during the Saxon period, though this is limited to objects such as brooches (NHER 18455, 24793 and 25710), and strap fittings (NHER 25709, 28216 and 31665), as well as a Late Saxon iron spearhead (NHER 9590) and the more common pottery sherds (NHER 15553, 30073 and 35036). Trowse is listed in the Domesday Book, which interestingly mentions the existence of a mill. Although there is no record of a mill in the Saxon or medieval period, there is evidence for structures on the Trowse Watermill site (NHER 9610) from the 16th century onwards, and this is an ideal site for such a building. 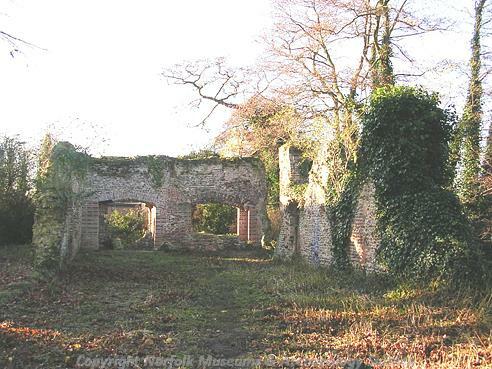 The ruins of Trowse Newton Hall (NHER 9657) can also still be seen. These are situated in Whitlingham Country Park, and may be the ‘Newton’ Hall from which the parish takes its full name. The current structures date to 1450, when they formed the country seat of the Priors of Norwich. Unfortunately they were significantly damaged during the food riots of 1766, and later deliberately ruined in 1890. Some recognisably Perpendicular style tracery can be seen, as well as a Perpendicular style doorway. Buildings from the medieval period are limited, and the only other extant structure is the parish church (NHER 9611). Dedicated to St Andrew, the church has an important chancel, built between 1282 and 1283 by Master Nicholas. Inside, there is one of the classic East Anglian octagonal fonts, as well as life-sized wooden figures of King David and angels, which were donated by the Colman family in 1902. Indeed the proximity of the Colman factory site at Carrow, just 550m to the northwest, meant that Trowse was one of the primary villages from which workmen were drawn. As a result, a large part of the village came to be owned by the Colman family, as it is today. In addition, the construction of a number of cottages for the families of workers took place, including the Crown Point and Blockhill Villas (NHER 9698). However, one of the most substantial post medieval buildings to be built was Crown Point Hall, now known as Whitlingham Hospital (NHER 9696). It was built in 1865 for Sir Robert John Harvey, to the designs of H. E. Coe. However, Sir Harvey’s suicide resulted in the sale of the site to the Colman family in 1872, and it was extended between 1902 and 1905 under the prolific Norfolk architect, Edward Boardman. Crown Point Hall also had an extensive Park (NHER 37582), which was sold along with the Hall to the Colmans. The Norwich Southern Bypass now bisects these extensive grounds, and the northwest corner is taken up with an artificial ski-slope, but the remains of some of the planting can still be made out, particularly as some of it is preserved within Whiltlingham Country Park. Also of interest is Trowse Old Hall (NHER 9939), which was constructed in 1721 and reconstructed after being burnt out in 1766 during the bread riots, as well as the Old Hall Farmhouse (NHER 25150), which dates to 1740. A number of objects from the medieval and post medieval periods have been recovered, the most interesting of which are a 13th or 14th century copper alloy arrowhead (NHER 9591) and seal (NHER 15788), as well as a medieval pewter spoon (NHER 30198). Ruth Fillery-Travis (NLA), 2 May 2007.